Each one of us has experienced moments of stress or anxiety produced by everyday occurrences like traffic, arguments, looming deadlines, etc. Then somewhere around 18.1% of the American adult population has experienced this anxiety to the point of having an anxiety disorder. Either way – we need help. What are we to do about all of this stress, worry, and nervous unease? Instead of making pharmaceuticals our first line of defense, I’m here to suggest some all natural methods that could add up to real relief. One of those methods are essential oil blends for anxiety. Using an essential oil for anxiety isn’t just some nice idea or helpful placebo effect. Real scientific study has shown us time and time again that these treatments can be just as effective as medications with significantly (and I mean significantly) fewer negatives. And unlike most health conditions which affect some people, but not others, stress and anxiety plague us all – though at very different degrees – which means an essential oil for anxiety can help every single human being. So whether you’re a normally calm and peaceful person going through a stressful patch or if you feel crushed by the weight of an anxiety disorder – read on! The stress response is part of the human condition and is actually designed to save our lives from danger. It prepares us for fight or flight. Any time we face a challenge – whether it be a difficult conversation with an employer or literally running from a hungry lion – our body shoots chemicals like cortisol and adrenaline through our bodies to get us ready to face that challenge (1). All of this means the stress response is a good thing…or at least it’s supposed to be under the right conditions. When this response is infrequent and in alignment with truly stressful events, it’s all good (though not fun!). When it happens repeatedly, even when life isn’t all that challenging, it can be a full-on anxiety disorder that harms our happiness and lives. An anxiety disorder could stem from past trauma (like PTSD) or difficult life events, it could come from biological factors, and it could come from lifestyle choices (2). Why Use Natural Remedies for Anxiety? There are four main types of medications being used to treat the wide variety of anxiety disorders. Below I’m going to introduce you to them and also describe some of the most common side effects – which you’ll see are quite problematic (3, 4). Selective Serotonin Reuptake Inhibitors (SSRIs): These pills block serotonin from being absorbed, so you have more of it to boost your mood. They can often lead to weight gain, insomnia, and sexual dysfunction. Serotonin-Norepinephrine Reuptake Inhibitor (SNRIs): These do the same thing as the SSRIs plus they also prevent the reabsorption of norepinephrine as well. Similar side effects are headache, heightened blood pressure, and upset stomach. According to the Anxiety and Depression Association of America, SNRIs are often the first line of treatment. Benzodiazepines: These include medications like Xanax and Valium and are used to really reduce physical symptoms of anxiety. They are supposed to only be for short-term treatment of anxiety (though many stay on long-term), but quickly fall into problems of dependence or tolerance (needing more and more to achieve the same effect). They can lead to sleeping problems and drowsiness. Tricyclic Antidepressants: These pills can cause your blood pressure to drop when you stand, blurry vision, and urinary retention. Not only can taking these medications cause all of these negative side effects, but trying to get off of these medications can also be extremely difficult and even harmful. For example, benzodiazepines need careful tapering otherwise the withdrawal symptoms can be extremely painful and even fatal (5). Yet, these medications remain the most common pills prescribed by a physician. In fact – they are the primary medications taken by those between the ages of 18 and 44. Over 1 in 10 people in the United States are on anxiety medications. Without a doubt, there are some cases when medical intervention is necessary. In these cases, you should be intentional about finding a doctor who understands the risks, prescribes correctly, and remains open to other alternative treatments as well. But for many of us, medication isn’t our only choice. There are many things we can do to deal with anxiety (whether it be a quick acute case or a chronic disorder) that do not lead to the same detrimental side effects. While these are all fabulous options, in this article we are going to focus on the essential oil for anxiety. So what’s the best essential oil for anxiety? There are a few! Below I’m going to explain why each essential oil for anxiety is so effective, and share lots of studies that have proven these ideas to be true. If you could only choose one essential oil for anxiety ( and have it be the best essential oil for anxiety ) it would undoubtedly be lavender. Of course, the focus should be on essential oil blends for anxiety that combine their strengths for a significant relaxing effect. But there’s no doubt that lavender is a powerful tool for combating stress and anxiety on its own. 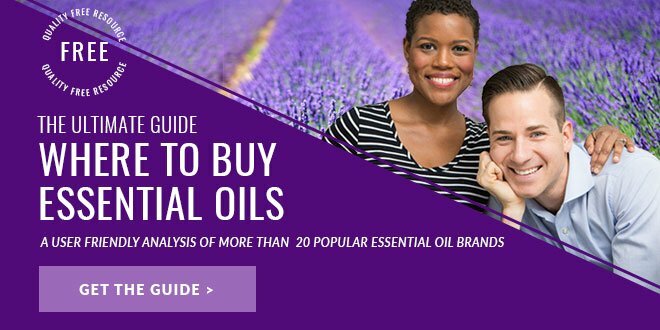 A 2016 study gave women who had just delivered a baby a lavender essential oil treatment (inhalation) for 4 weeks. They found that stress, anxiety and depression significantly reduced at both the 1 month and 3 month postpartum points (8). The next essential oil for anxiety is Frankincense, one of the most powerfully healing oils for the body – and its strengths are just as helpful for your mind and emotions. One study aimed to see if an essential oil blend for anxiety, which included frankincense, lavender, and bergamot could have an effect on pain, anxiety, and depression in hospice patients with terminal cancer. They applied the essential oil blend for anxiety through a diluted hand massage (they used sweet almond oil). Unsurprisingly, the blend had a positive effect (10). Which all makes sense when you think about the fact frankincense has been used in religious and spiritual ceremonies for centuries. It’s a peaceful oil. The earthy and woody vetiver is extremely grounding in nature – something anybody feeling stress needs more of. And this essential oil for anxiety may be just as effective as popular anxiety medications. Diazepam (the most common brand name is Valium) is a common anxiolytic and sedative belonging to the benzodiazepine family – remember these medications shouldn’t be taken long term, and they can be quite dangerous to get off of. Both the vetiver oil and the diazepam lowered the gene (c-fos), which is involved in anxiety. This is huge news. The researchers concluded that vetiver just may actually be able to alter the brain activity enough to lower the anxiety process (11). If a mug of chamomile tea can help calm you before bed, the concentrated Roman chamomile essential oil for anxiety can go even further! One study combined lavender with the Roman chamomile (and a tiny bit of neroli) and gave an aromatherapy treatment to intensive care unit patients getting a percutaneous coronary intervention (PCI). The researchers wanted to see how this oil combo would affect anxiety, sleep, and blood pressure. They were treated with this essential oil blend for anxiety 10 times before the PCI and 10 times after the PCI. The aromatherapy group had “significantly low anxiety” as well as improved sleep compared to the control (12). Rose is uplifting and calming at the same time – making it a perfect essential oil for anxiety and depression. Anxiety and depression often go hand in hand, so be sure to check out our guide to essential oils for depression as well. One of the most anxiety-producing times is when a first-time mother is entering childbirth. The fear of pain can even cause cramps interfering with the contraction/delivery process. Rose can help! One study broke into three groups of 120 women who were pregnant for the first time. One group received 10 minutes of rose oil inhalation and a rose oil foot bath. Another group received 10 minutes of a warm water foot bath. The final group received only routine labor care. Both treatments help to reduce anxiety of mothers but the rose oil group had the lowest anxiety when it came to the beginning of the active labor phase (13). The next best essential oil for anxiety is ylang ylang – a sweet, yet spicy oil that was used traditionally in religious or wedding ceremonies. In today’s world, one of its most popular uses is de-stressing. A 2006 study found that topical ylang ylang use led participants to feeling calmer and more relaxed than control groups (14). One other study even showed that an essential oil blend for anxiety of ylang ylang, lavender, and lemon could bring down blood pressure and sympathetic nervous system activity (15). But perhaps one of the most interesting ways ylang ylang becomes a fabulous essential oil for anxiety is its ability to calm sexual anxiety and enhance the libido (16). Finally, we get to our last essential oil for anxiety, and it’s one of the more specialty oils. Marjoram is typically only thought of in terms of spicing up your meal. It’s often in soups or dressings. But it’s also extremely calming and it’s one of my absolute favorite essential oils for relaxation. Adding marjoram to one of your essential oil blends for anxiety is key. A 2012 study looked at 83 patients with pre-hypertension or hypertension and split them up into three groups. One group was given an essential oil treatment with lavender, ylang-ylang, marjoram (and a tiny bit of neroli). The second group inhaled artificial fragrances. The third inhaled nothing. The essential oil group had lower cortisol counts, improved blood pressure, and overall reduced stress (17). Another study showed that combining this spicy oil to other ingredients like lavender and juniper helped improve the well-being in older patients (as well as improve sleep) (18). When used internally, it can even positively affect the nervous system. Now let’s dive into how to use an essential oil for anxiety most effectively. Typically, the best thing to do is to choose a few and create an essential oil blend for anxiety. Diffusing an essential oil for anxiety during times of low, moderate, or high stress can be a great way to prevent a full-on anxiety attack and give you peace of mind. Feel free to experiment with diffusing each essential oil for anxiety on this list. Some people respond better to certain oils than others. While one may feel calmed by the sweet, high frequency of rose, another may feel calmed by the earthy vetiver. Tip: If you don’t have a diffuser, you can easily put a couple drops of two of your favorite oils into a spray bottle with water and a splash of vodka (for good mixing), and spray your pillow and/or sheets before you hop into bed. Using an essential oil for anxiety topically gives you a double win. You get the benefits of the essential oil blend for anxiety plus you get the relaxation of a soothing massage. I like focusing on two areas in particular: my feet and my neck. The feet are one of the best places to absorb essential oils in the body. And the neck is often one of our most tense regions. Here’s a calming essential oil blend for anxiety that I love from the blogger Jams and Scones. It’s packed with some of the most potent oils for stress, worry, and anxiety. Add all of your drops into a 10 ml rollerbottle and then top it off with the carrier oil. Shake and use whenever you need a little peace in your life. A warm bath is a fabulous way to calm the body on its own. Add in some essential oil for anxiety, and you’ve got yourself a wonderful all-natural treatment. A few of these oils can be taken internally to help add extra feelings of calmness. Not every type of essential oil should be used internally (and certainly not every brand has high enough quality!). But if you choose a reputable brand this can really be an extra benefit. Tip: That same doTERRA Serenity blend I mentioned before is offered in softgels to help you calm your anxieties and sleep well. This can be a convenient option for you as well. Using an essential oil for anxiety to beat everyday stress or to help you overcome an anxiety disorder can be a really empowering thing. It’s one of many small steps you can take to make sure your health and wellness includes your mental and emotional self too! What are your favorite natural remedies for anxiety or stress? Do you ever turn to an essential oil blend for anxiety? What is the best essential oil for anxiety that you’ve found? Please share your thoughts with our community in a comment below.